An incredibly flavorful Coconut Curry Soup prepared in 20 minutes! 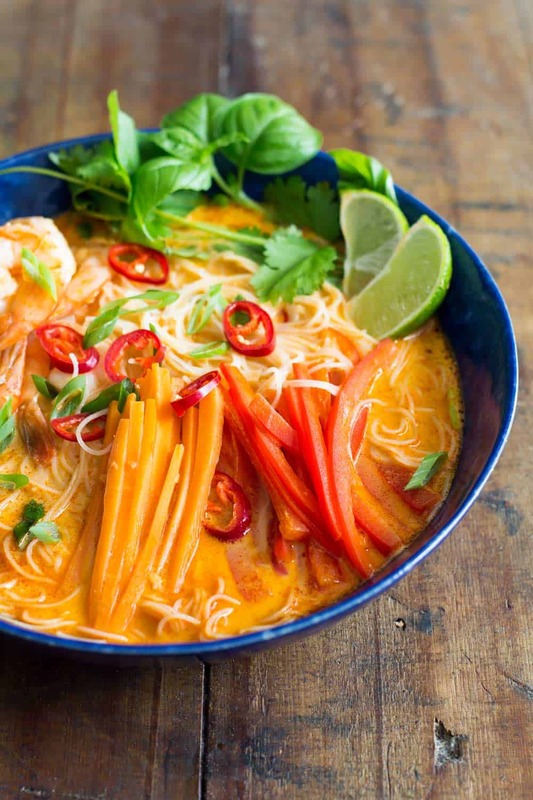 Rice Noodles, shrimps, and veggies in a delicious broth with Thai curry and coconut milk! 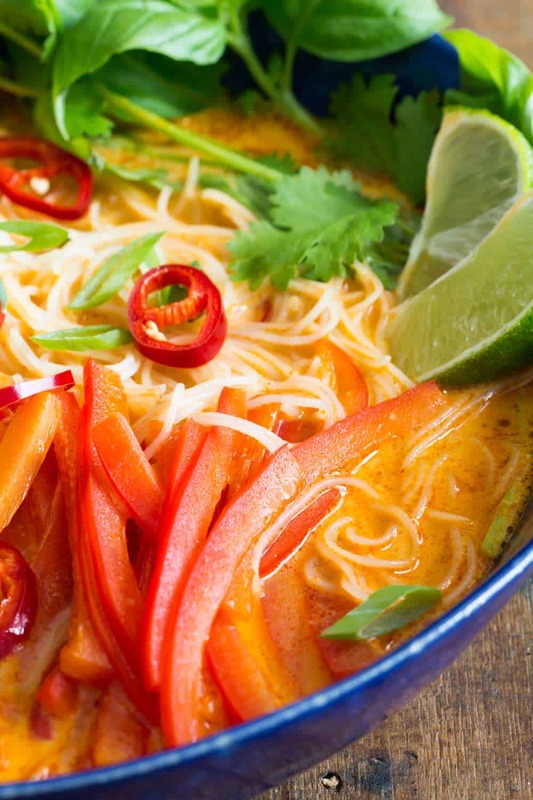 This recipe was inspired by Heather Christo’s Spicy Thai Curry Soup. It looked so delicious to me that I had to have a go on my own version. And tadaaaa, this is how this Coconut Curry Soup came into life! It tastes beyooond amazing and it’s warm and spicy and extremely flavorful. 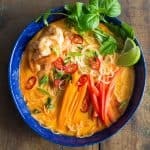 Green Healthy Cooking has its fair share of Thai curry recipes, so it actually surprises me that I’ve never posted a Thai curry SOUP recipe here yet. I mean, remember this amazing Sweet Potato and Chickpea Curry? Or this Thai Chicken Cauliflower Curry? Sooo good! Now I’ve got a soup to add to my “Obsessed with Thai Curry Recipes”-List. The great thing about this soup is you can serve it with different kinds of protein. It tastes great with shrimps, with white fish filets, with cubed chicken breast, with scallops. Use vegetable broth and add the boiled egg on top and make it vegetarian. Or use vegetable broth, add some chickpeas and make it vegan. The broth is extremely versatile. Make a big batch of Coconut Curry Soup broth and sliced veggies and use it to make many different soups throughout the week. One day with shrimp, one day with chicken, one day with egg and one day with chickpeas. 4-day meal prep dinner done in 10 minutes + 10 minutes each evening to cook your protein and assemble. 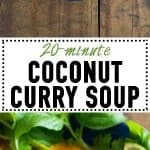 Can you freeze coconut curry soup? Absolutely! Without the protein though if you plan on defrosting in a pot. If you freeze it with the shrimps/chicken etc. you have to let it defrost in the fridge overnight. Defrosting in a pot by cooking it until it’s not frozen anymore overcooks the protein and it becomes all dry or chewy. If you are an uber organized person then, by all means, freeze the complete soup. Put in the fridge the night before, then reheat in a pot only until it starts to boil and immediately remove from heat an eat immediately. If you are a mess (hello my friend), freeze only the Coconut Curry Soup Broth with the vegetables. Take out of the freezer and dump in a pot and heat on medium low while preparing protein in a separate pan to then mix together. Shrimps and scallops tend to be super expensive when you buy them fresh though you live far from the sea. You can easily use frozen. They defrost super easy and fast. Put in cold water for 20-ish minutes or until completely defrosted. Rinse and drain! Then lay individually on a paper towel to absorb water and pat dry with more paper tower from the top to ensure they are completely dry. Here is the reason why this is important. If you fry them in a pan they get beautiful color and texture. If you “cook” them in water or “steam” them in their own juices they become small and chewy and yucky. Take the time to pat them dry. Heat a pan over medium heat and wait until it’s really really hot. Add some oil and wait for that to be really really hot, too. THEN add the shrimps or scallops. Fry for about 1 minute on one side, another minute on the other and immediately remove from the pan so they don’t overcook. An incredibly flavorful Coconut Curry Soup prepared in 20 minutes! 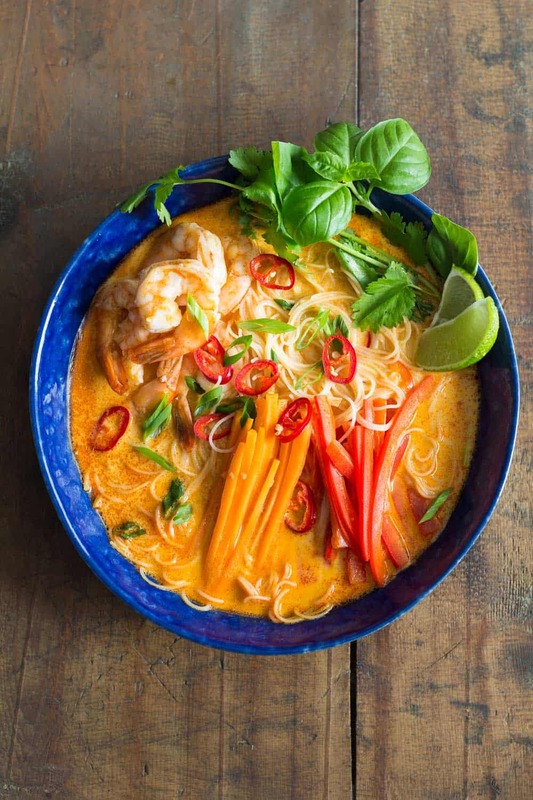 Rice Noodles, shrimps, carrot, bell pepper in a delicious broth with thai curry and coconut milk! (if you are a slow veggie slicer then start by washing and thinly slicing veggies before starting the cooking process otherwise, start with this step:) Preheat large pan over medium heat. Rince, drain and pat dry shrimps. Add 1/2 Tbsp coconut oil to hot pan, wait until oil is hot and add shrimps. Salt and pepper and fry for 1 minute on one side, then turn and fry for another minute or until nice and orange. Remove from pan and set aside in a bowl. Heat a large pot over medium heat. In the meantime, grate ginger with a cheese grater and peel and crush garlic. Add 1/2 Tbsp coconut oil to the pot, wait until oil is hot and then add grated ginger, crushed garlic, and Thai curry paste. Stir fry until fragrant (about 1 minute). Add broth and coconut milk, stir to combine, salt and pepper to taste (make it a little bit too salty, the rice noodles will absorb saltiness later) and get to a boil. In the meantime, peel and julienne (very thinly sliced) carrot and wash and julienne bell pepper. Add a square of rice noodles to a large bowl, add half of the julienned carrot and half of the julienned bell pepper and cooked shrimp to a bowl and pour BOILING broth over all ingredients. Repeat with the second bowl. Let sit for 3-4 minutes, then use a fork to break noodles apart a little. Squeeze some lime juice over them. Add a couple slices of the green part of scallion and a couple slices of red chili on top and add a string of basil and a string of coriander to the bowl. This recipe calls for rice vermicelli - a very thin type of rice noodles - which cook perfectly fine if soaked 3-4 minutes in initially boiling broth. If your rice noodles are thicker you'll have to cook them in constantly boiling broth for a couple of minutes, i.e. add the noodles to the broth in the pot and boil, then transfer to bowl. I made this & its Devine. I added some chopped baby Nik Choy. Can you freeze this recipe? Hi Janine, I’m glad you liked it. I’ve never tried freezing it so I’m not sure. I would think that without the noodles it should be easy to freeze with noodles it could become weird once you reheat because they would overcook. I made this tonight and it was delicious. The noodles I bought had a really grainy texture though. Is that the goal? 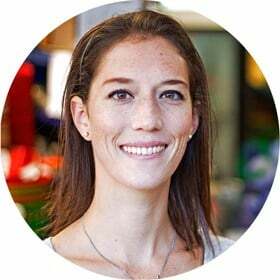 Hi Jenny, no they shouldn’t be grainy. There are rice noodles of different thicknesses on the market I learned later. The ones I used are very very thing. If yours are thicker they will need to cook a little longer. Maybe a minute longer. So instead of pouring the boiling soup over the noodles, add the noodles to the boiling soup and let them cook for about a minute or two, then pour into a plate and let sit until they finish cooking and add veggies etc. Hi there! For the 2 tbsp of red thai curry, is that red thai curry paste? I use 2 cups lite coconut milk & 2 cups low sodium chicken broth…..pinch cumin, turmeric some lemongrass paste….yum! The flavors in this look amazing. I am definitely a sucker for Thai flavors. This looks amazing,I’m looking forward to making this soup. Did you use fresh chicken stock or boullion cube? my package had 4 nests (squares) and the total was 250g so, 1 was 62.5g. So the weight of ONE square in ounces is approximately 2.2 oz.